The Detroit Cast spoke with Zack O’Malley Greenburg about his book “3 Kings: Diddy, Dr. Dre, Jay-Z, and Hip-Hop’s Multibillion-Dollar Rise,” covering the history of hip-hop and explaining how these three moguls turned it into one of the world’s most influential and lucrative cultural movements. Being successful musicians was never enough for Diddy, Dre, and Jay-Z, who lifted themselves from childhood adversity into tycoon territory, amassing levels of fame and wealth that not only outshone all other contemporary hip-hop artists, but with a combined net worth of well over $2 billion made them the three richest American musicians, period. Greenburg explains, however, that their fortunes have little to do with selling their own albums: between Diddy’s Ciroc vodka, Dre’s $3 billion sale of his Beats headphones to Apple, and Jay-Z’s Tidal streaming service and other assets, these artists have transcended pop music fame to become lifestyle icons and moguls. Greenburg argues that these three embody the American Dream, but their stories as great thinkers and entrepreneurs have yet to be told in full. 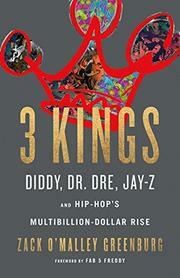 Based on a decade of reporting, and interviews with more than 100 sources including hip-hop pioneers Russell Simmons and Fab 5 Freddy; new-breed executives like former Def Jam chief Kevin Liles and venture capitalist Troy Carter; and stars from Swizz Beatz to Shaquille O’Neal, “3 Kings” tells the fascinating story of the rise of the three most influential musicians in America.